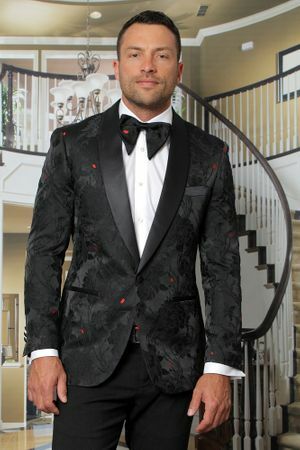 Get your red carpet look ready with this Manzini men's black floral tuxedo blazer. The style is pure Hollywood with it's head turning style. Featuring a fitted look that feels like it was tailored for you. You won't go wrong when you have to impress the crowd wearing this fitted black floral tuxedo blazer. Bow is included while supplies last.